Last Sunday, my husband and I visited his uncle who was confined at Tondo General hospital in Manila. The patient suffered from headache and severe pain in his head resulting to dizziness, vision problem and loss of appetite.He was confined for over a month now and the doctor recommended him to look for oncologist and neurologist. Good thing that he is a little better now but still he needs to consult for the specialist that the doctor advise. I can say that the hospital premise is clean. The ward rooms were not as big as the rooms compared to my visit at San Lazaro hospital. There are visiting hours in the morning and in the afternoon compared to San Lazaro that visiting hours is only 4Pm to 7Pm. I am not sure of the exact time of the visiting hours there. The security guards were nice as well as the doctors and nurses. Every time I go to the hospital I love taking pictures along the hallway. 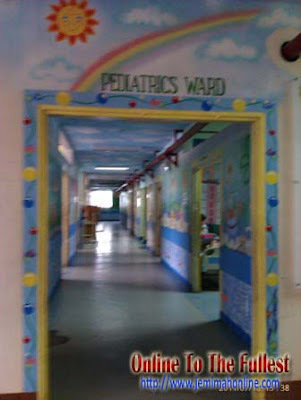 While walking along the hallway, I noticed their cute pediatrics ward so I also took a photo of it. If you will be going to Tondo General hospital be sure not on rainy days because there is a slight build up of floods outside the hospital. Thank God that our private vehicle went through without a problem and the rain diminished at that time. Tondo general hospital is located at Kalakal Street Corner Honorio Lopez Boulevard Balut, Tondo Manila Metro Manila 1000, Philippines with contact Telephone number +6322518422. 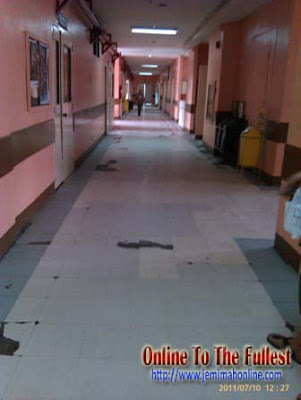 This entry was posted in Places and tagged public hospital manila, tondo gen, tondo general hospital, tondo hospital. Bookmark the permalink.